In a perfect world, I would upload a lot more entertaining pictures for you to see on this blog. Alas, the world isn't perfect, and you are stuck (for the most part) with my pithy observations on life. I took this picture over a year ago, and I still wonder about it. I still wonder, "What on EARTH was the driver thinking?" The picture seems to be telling us that the driver had a big sense of entitlement ... or possibly extremely bad eyesight. On the other hand, maybe the driver had a kid in the backseat who was newly potty trained screaming, "ME NEED GO POTTY" in his ear until he went nuts and stopped the car in the first spot big enough. Hey, I can see that. The parking lot is pretty close to an exit for a major highway, and I know people who would do a lot worse to keep a kid from screaming ... or to avoid cleaning up potty in a carseat. I can also see that perhaps little leprechauns got mad at the driver and lifted his car 10 miles away and abandoned it for him in front of Safeway. Hey, weird things happen in this world, right? Or maybe someone in the car was addicted to caffeine and they had to stop at the first available Starbucks, which is visible in the distance in the photo. I have heard that latte addictions can get really bad. How about this -- it was the guy's anniverary and he forgot and he was running to the grocery store to bring home a pre-cooked dinner, some flowers, wine, chocolate, and a bunch of balloons and he was already late. Or ... he was supposed to order pizza for the youth league's annual awards dinner and he forgot so he stopped to pick up a bunch of frozen pizzas from the grocery store? I don't know. Beats me. Since there is a wheelchair on the plate and the car is ancient. 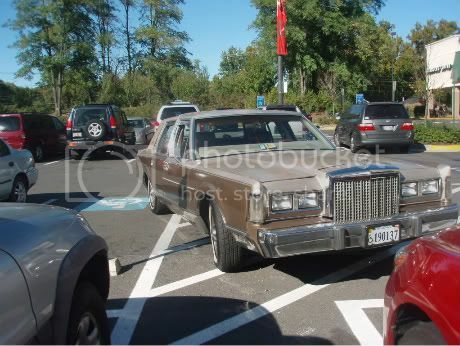 My vote is an old guy who can barely see and thinks he's the only person with a handicap permit so no one might possibly need the wheelchair lift area or the space to load a wheelchair so why should he bother to even try to park his car in between the lines. Makes you wonder if that person should still be driving.